In world wide televisual feast of death, one girl must use her skills with a bow to survive all odds. President Snow:"She shot an arrow at your head." Seneca Crane:"Well, at an apple." Caesar Flickerman:"So Peeta. Tell me. Is there a special girl back home?" Peeta Mellark:"No. No, not really." Caesar Flickerman:"No? I don't believe it for a second, look at that face! Handsome man like you! Peeta. Tell me." Peeta Mellark:"Well, there uh. There is this one girl that I've had a crush on forever. But I don't think she actually recognized me until the Reaping." Caesar Flickerman:"Well, I'll tell you what Peeta. You go out there, and you win this thing, and when you get home she'll have to go out with you. Right folks?" Peeta Mellark:"Thanks, but I, uh. I don't think winning's going to help me at all." Peeta Mellark:"Because she came here with me." Caesar Flickerman:"Well that's bad luck." Haymitch Abernathy:"He's a career. You know what that is?" Haymitch Abernathy:"And two. They train in a special academy until their 18. And then they volunteer. By that point, they're pretty lethal." Effie Trinket:"But they don't receive any special treatment. In fact, they stay in the exact same apartment as you do. And I don't think they let them have dessert, and you can." Haymitch Abernathy:"Embrace the probability of your imminent death and know in your heart that there's nothing I can do to save you." Katniss Everdeen:"And may the odds be ever in your favor." Effie Trinket:"Happy Hunger Games and may the odds be ever in your favor." President Snow:"Seneca, why do you think we have a winner?" Seneca Crane:"What do you mean?" President Snow:"I mean, why do we have a winner? I mean if we just wanted to intimidate the districts why not round up twenty four of them at random, and execute them all at one? It would be a lot faster. Hope." President Snow:"Hope. It is the only thing stronger than fear. A little hope is effective. A lot of hope is dangerous. A spark is fine, as long as it's contained." Haymitch Abernathy:"Look at you. You just killed a placemat." Gale Hawthorne:"Listen to me, you're stronger than they are. You are. Get to a bow." Katniss Everdeen:"They may not have a bow." Gale Hawthorne:"You will if you show them how good you are. They just want a good show, that's all they want. If they don't have a bow, then you make one, okay? You know how to hunt." Gale Hawthorne:"There's no difference Katniss." Haymitch Abernathy:"Tomorrow they'll bring you in one by one and evaluate you. This is important because higher ratings will mean sponsors. This is the time to show them everything. There will be a bow, make sure you use it. Peeta, you make sure to show your strength. They'll start with district 1, so the two of you will go last. Well, I don't know how else to put this. Make sure they remember you." Claudius Templesmith:"Attention. Attention, tributes. There's been a slight rule change. The previous revision allowing for two victor's from the same district has been revoked. Only one victor may be crowned. Good luck. And may the odds be ever in your favor." Haymitch Abernathy:"You made me spill my drink and these are brand new pants." Haymitch Abernathy:"Give me a chance to wake up sweetheart. This 'mentoring' is very taxing stuff." Katniss Everdeen:"Thank you for your consideration." President Snow:"So you like an underdog?" Seneca Crane:"Everyone likes an underdog." President Snow:"I don't. Have you been out there, 10, 11, 12?" Seneca Crane:"Uh, not personally no." President Snow:"Well I have. There are lots of underdogs. Lots of coal too, grow crops, minerals, things we need. There are lots of underdogs, and I think if you could see them, you would not root for them either." Katniss Everdeen:"I volunteer as Tribute!" Claudius Templesmith:"Ladies and gentlemen. May I present the winners of the 74th annual Hunger Games." Haymitch Abernathy:"I hear you can shoot." Peeta Mellark:"She's better than alright. My father buys her squirrels. He says she hits them right in the eye every time." Katniss Everdeen:"He can throw a hundred pound of sack of flour right over his head, I've seen it." Peeta Mellark:"Okay, well I'm not gonna kill anybody with a sack of flour." 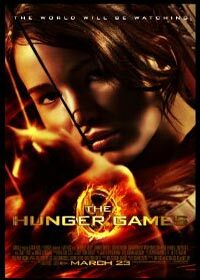 Katniss Everdeen:"No, but you might have a better chance of winning if somebody comes after you with a knife." Peeta Mellark:"I have no chance of winning! None! Alright!? It's true. Everybody knows it. Do you know what my mother said? She said district 12 might finally have a winner. But she wasn't talking about me, she was talking about you."